I admit it, I have a bit of a weak spot for shallow hard coral gardens. I know most people think they are simply a nice bit of reef to look at, but don’t find them overly photogenic and give them a quick “once over” before looking for critters or heading down the wall. However, I could take photos of hard corals for hours on end. If an area has a healthy hard coral reef, then it’s usually a strong indicator of the overall health of the marine environment in that region. As hard corals are very fragile, they are often the first life forms to be destroyed when a major catastrophe happens such as a large storm or “El Nino” style event. Unfortunately, I have seen all too often the devastating effects of El Nino, typhoons, crown of thorn starfish outbreaks, and dynamite fishing; all of which can completely destroy a beautiful coral garden within a very short time. Therefore, when I find healthy and extensive hard coral gardens I just can’t help taking photos from every angle. I visited a new location last week called Parigi Moutong, which is located in the SW corner of Tomini Bay in central Sulawesi, and I had the opportunity to get in the water for three dives. One of the first things that I noticed while surveying the area was the health of the hard corals as well as bright blue water. I have to say that the corals in Parigi Moutong were surprisingly healthy and abundant along the reef drop-offs and I spent most of my dives in the shallows documenting the beautiful forms of these reefs. 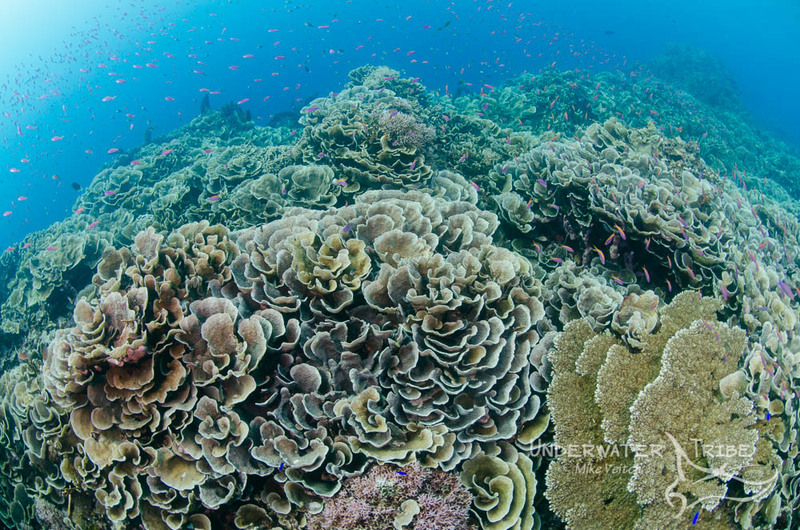 This photo is of the hard coral garden on the dive site “Rose”, was taken with a Nikon D7000 and Aquatica housing with a 10.5mm lens and Magic Filter at f8, 1/40. I simply made sure my strobes were turned off, had the sun at my back, aimed slightly down and fired away.